Considered as the popular trekking route of Nepal, Everest Base Camp BudgetTrekking delivers with the beguile environment and outstanding scenery of the great snow-capped massifs. In 1953, Tenzing Norgay and Sir Edmund Hillary firstly summited the world’s highest peak – Mt. Everest, from onwards Everest Base Camp Trek popularity, has perked up, as a result, Everest has become the ultimate goal for mountaineers. 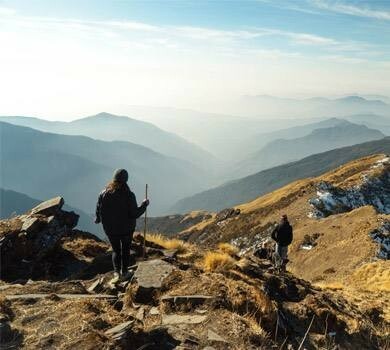 This budget trekking will be the perfect package who wants to reach the base of Mt. Everest out of their busy schedule with affordable cost. ……..participate in Everest Base Camp Budget Trekking to witness out the incredible Mt. Everest ones in a lifetime within a short duration. 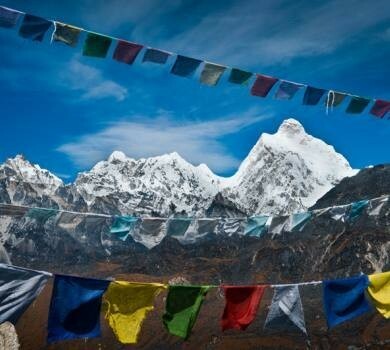 The Everest Base Camp Budget Trek passes through the dense forests, famous Sherpa’s villages, rivers, high passes, etc. with various existences of flora and fauna. The starting point of the Everest Base Camp Budget Trek is Lukla and leads to the famous destinations Namche Bazaar (3,440m/ 11287ft) -Sherpa Market, contains trekking equipments, Sherpa and Tibetians culture and tradition with tasty foods, organic coffee bar and accommodation, Tengboche Monastery (3,860m/ 12665ft)- to the oldest monastery and the local residents (Sherpa’s) reflecting their culture and tradition, Dingboche (4,410m/ 14469ft)-refers as the last human settlement area of Everest Region and Pheriche (4,280m/ 14042ft)-presence of Sherpa’s and Tibetian societies. Why Everest Base Camp Trek (Budgeted)? Trekking to the base of Mt. Everest outshines one’s expectation/daydream. During the trek to Everest Base Camp, it is the lifetime opportunity for one to get friendly with the nature that consists a wide range of opulent resources, flora, and fauna. Along with this, trekking and climbing through Island Peak (6,189m/ 20,305ft) – one of the main climbing peaks in Everest Region with glaciated West Face that rises from the Lothse Glacier, creates an interesting moment for both novice and experienced trekkers that leads to the beautiful Khumbu valley- valley of majestic mountains and Everest Base Camp (5,364m/ 17,599ft). This budgeted trekking also leads to the popular destination like Everest Base Camp and Kala Patthar (5,550m/ 18209ft) for close views of the majestic mountains before climbing to the peak. Trekkers usually head towards Kala Patthar- the world’s best mountain viewpoint, early in the morning so that to get the mesmerizing views of snow-capped mountains and the beautiful sunrise. With the time for safe acclimatization regard as the key to success for trekking in the Everest region. 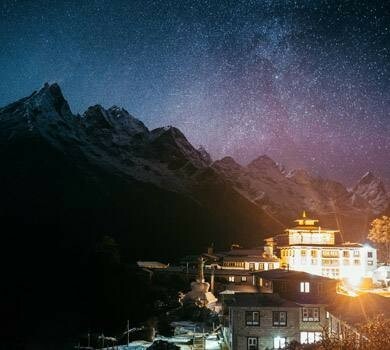 The Everest region has become the popular destination for the outsiders who want to explore the world’s highest peak and its surroundings (on the way to the destination). The presence of endangered species of flora and fauna has always attracted many tourists to this region. 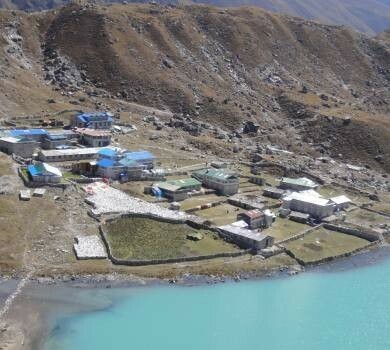 Along with this, the panoramic views of the nature and the existence of ancient culture and tradition of Sherpa’s and Tibetian communities offers with unique taste in this budgeted trekking. 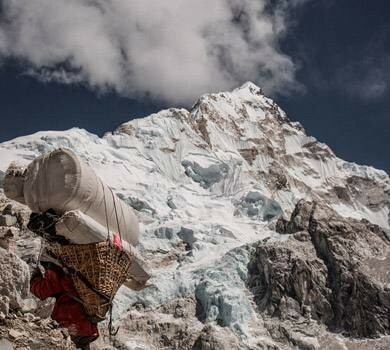 Everest Base Camp Budget Trek is a package of 10 days that is operated by the professional guides, porters, and crews that ascend to the base of the world’s highest peak – Mt. Everest. The perfect seasons throughout the year to participate in the Everest Budget trekking are Autumn (September to November) and Spring (March to May) and nevertheless January, February and December are also the best time to explore Everest region. 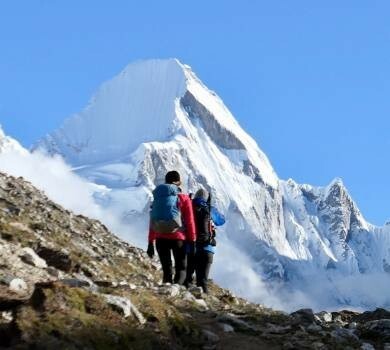 Get involved in this unique trek, thrilling and tranquil trekking route of Nepal, the team of Massif Holidays will provide with the detail information and help you to explore Everest Base Camp in the demanded budget with the best outcomes. Express Journey to Mt. Everest Base Camp. Trek in the Khumbu Himalayas. Cost includes all required permits, guide and porter. Two-night hotel in Kathmandu in tourist category hotel. Magnificent view of Himalayas from Everest Base Camp (5,360m/17586ft) and Kalapatthar (5,550m/18209ft). Getting the views of endangered species of birds, animals, and plants. Exploration of Sherpa’s communities in the Khumbu region. Scenic mountain flight, Kathmandu - Lukla - Kathmandu. 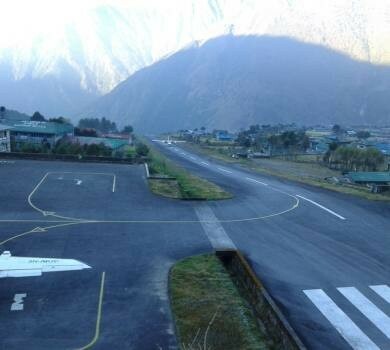 Day 01: Fly to Tenzing Hillary Airport in Lukla (2840 Meters) and trek to Phakding (2610 Meters) about 3 hours. Overnight stay at Guest House. Day 02: Trek to Namche Bazaar (3440 Meters) about 5 hours. Overnight stay at Guest House. Day 03: Trek to Tengboche Monastery (3860 meters) about 5 hours. Overnight stay at Guest House. Day 04: Trek to Dingboche (4410 meters) about 6 hours. Overnight stay at Guest House. Day 05: Trek to Lobuche (4910 meters) about 5 hours. Overnight stay at Guest House. Day 06: Trek to Everest Base Camp (5364 meters) via Gorakshep (5140m). About 8 hours. Overnight stay at Guest House at Gorakhshep. Day 07: Early morning, hike up to Kalapatthar (5550 meters) then trek down to Pheriche (4280 meters). About 7 hours. Overnight stay at Guest House. Day 08: Trek to Namche Bazaar (3440 meters) About 7 hours. Overnight stay at Guest House. Day 09: Trek to Lukla (2840 meters) About 6 hours. Overnight stay at Guest House. Day 10: Fly back to Kathmandu from Lukla. Overnight stay at Hotel. Airport/ Hotel pick up and drop by private transport vehicles. Flight tickets from Kathmandu to Lukla and fly back to Kathmandu. Government licensed holder well English speaking guide. Provide the porters for 2 each client and them of all expenses entire the trek. Insurance for guide and porter during the trip. All meals and accommodation during the trek. All the personal expenses like any soft and hard drinks, communication, internet etc. Travel insurance cover for helicopter evacuation. Tips for guide and porter (Recommended). Breakfast, Lunch and Dinner throughout the trekking package. Sightseeing in the historical and cultural sites.